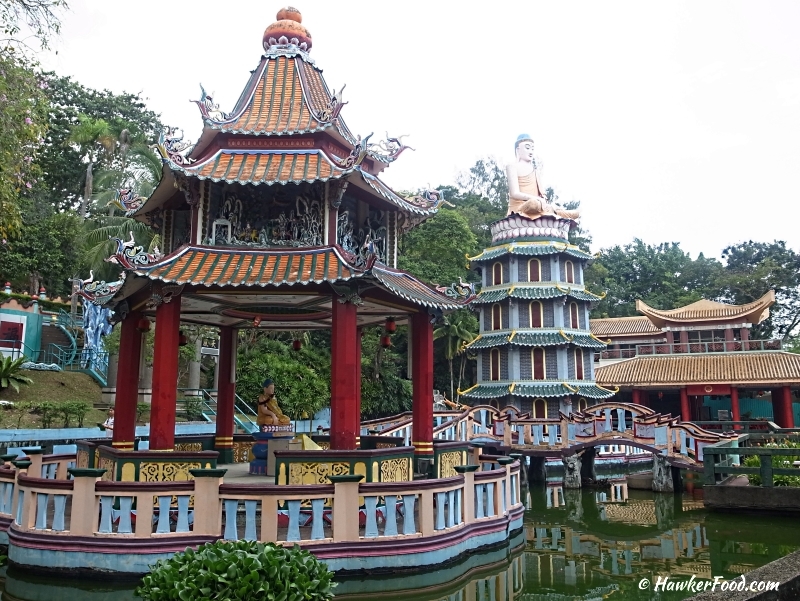 Almost every place of attraction in Singapore needs an entrance fee, entrance to Haw Par Villa however, is free. 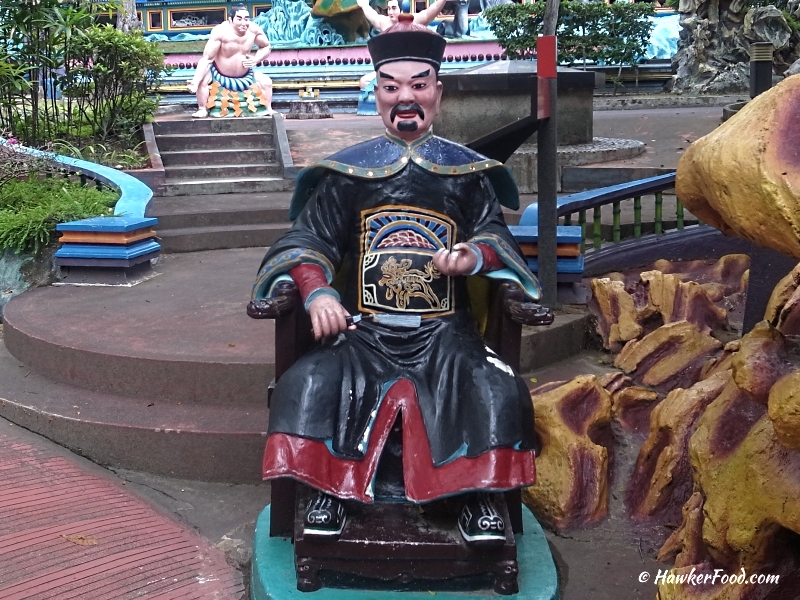 It had been more than twenty odd years since Lao Beng last visited Haw Par Villa when I was just in primary school. I still remember I was haunted by the sights that greeted me and had nightmares for a couple of days. 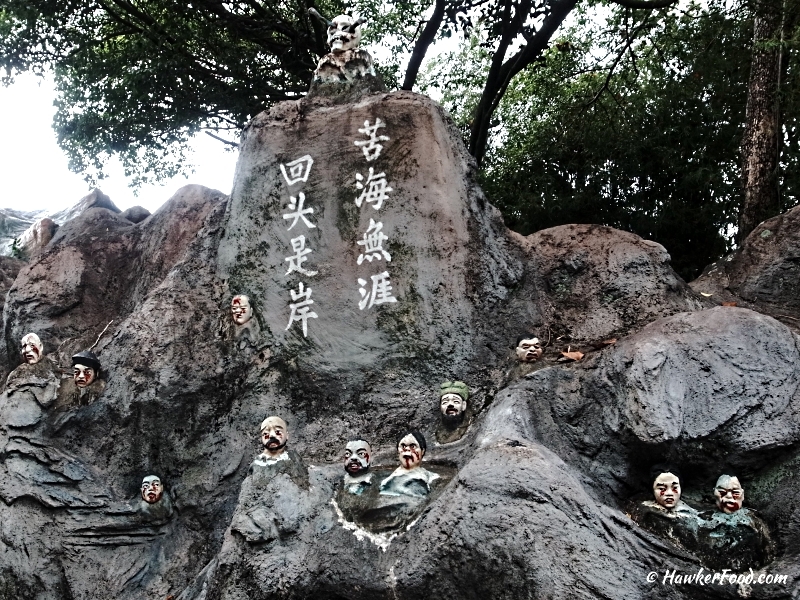 Back then, I will have this creepy feeling of being watched in Haw Par Villa. 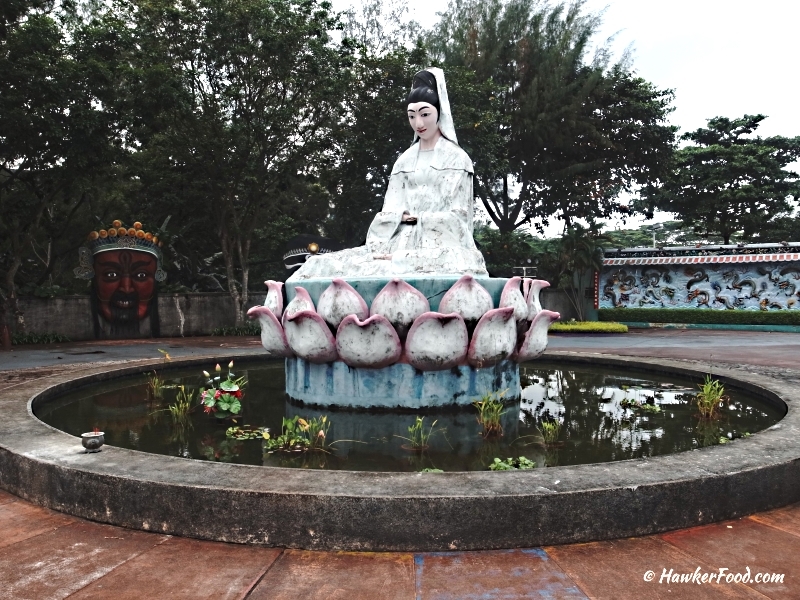 It is as though the eyes of the statues followed me wherever I went….. 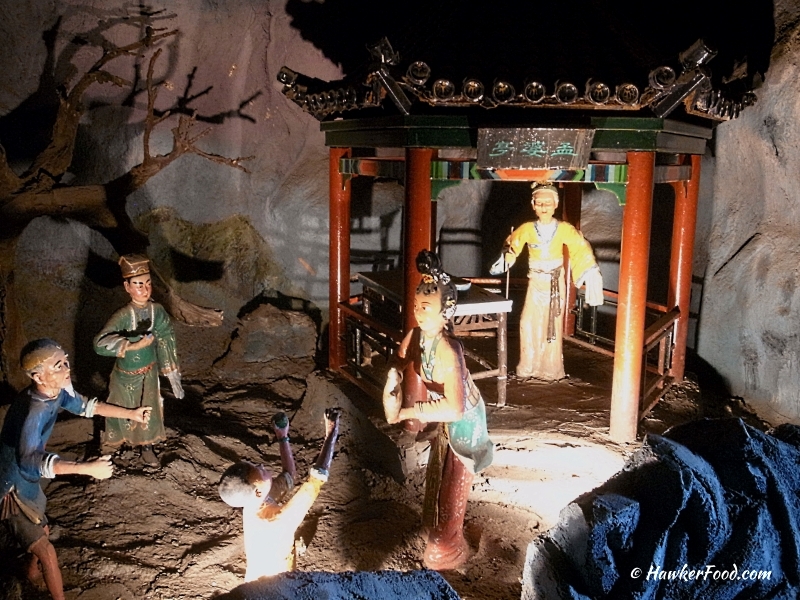 So, on a quiet weekday during the 7th Lunar month (Hungry Ghost Festival), I finally decided to revisit Haw Par Villa again. 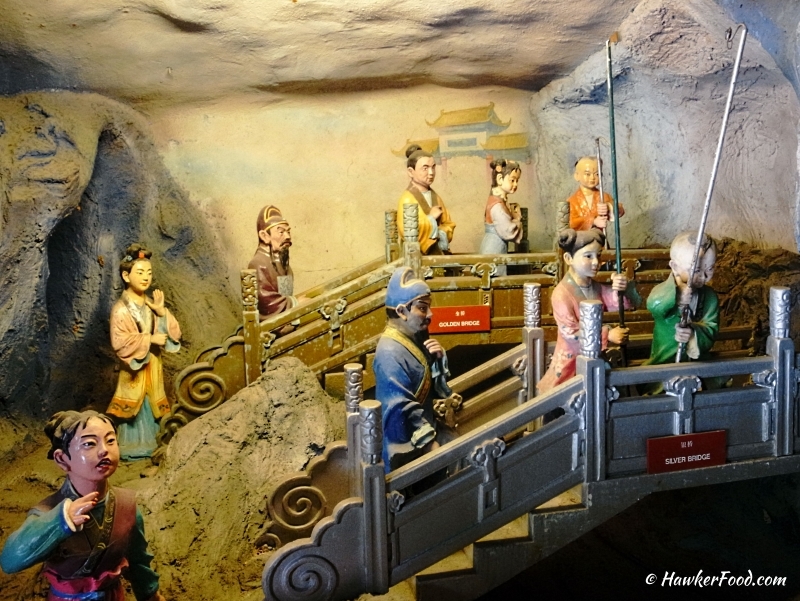 Unlike last time when it was arduous to travel to Haw Par Villa, it is so much more convenient now as the Haw Par Villa MRT Station (CC25) is just beside it. 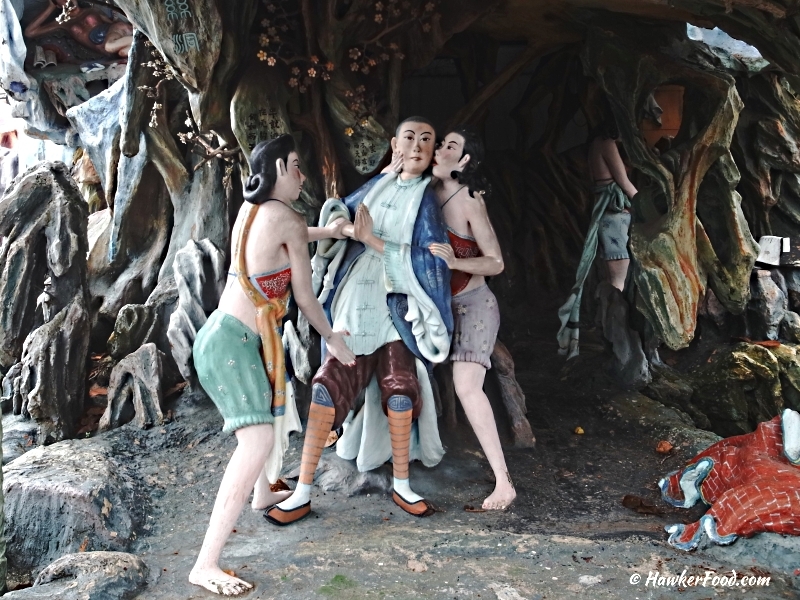 The strange coincidence is that on the same day I visited Haw Par Villa, Singapore Tourism Board broke the news that they had appointed Journeys, a travel company to operate and manage Haw Par Villa but admission will still be free. 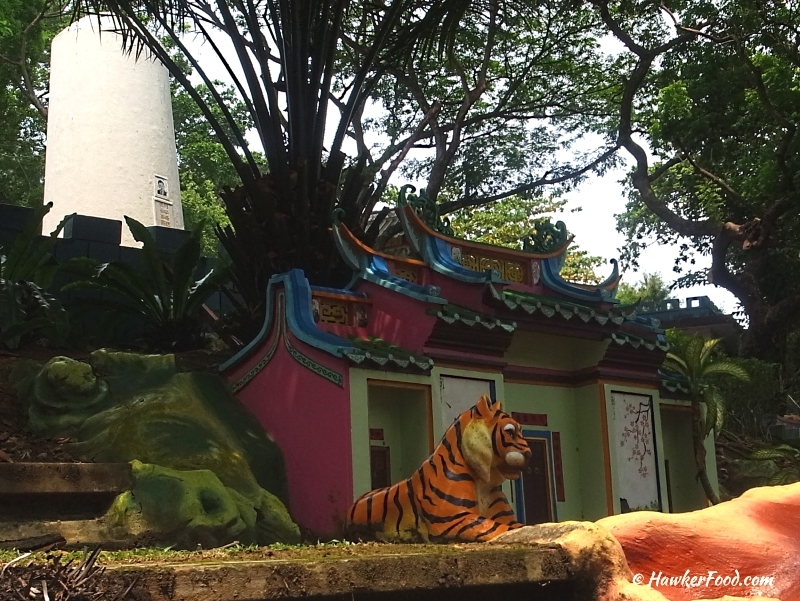 Some of us might know that Haw Par Villa was named after brothers Aw Boon Haw and Aw Boon Par, it was originally called Tiger Balm Gardens. 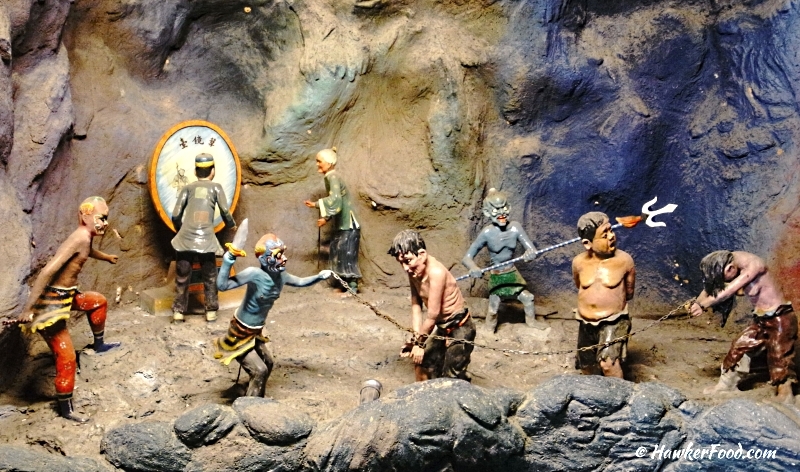 It was actually Boon Haw who built Haw Par Villa in 1937 for his brother Boon Par with the vision of creating a grand mansion and gardens filled with various Chinese Mythical Legends in the form of statues and giant dioramas, immortalizing them and at the same time teaching the common people moral values. So how did they venture into Singapore? 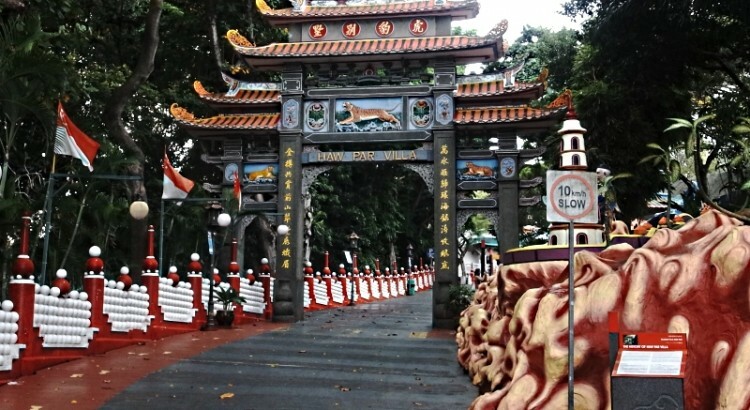 The two brothers were tasked to perfect the famous Tiger Balm ointment by their father Aw Chu Kin and they subsequently moved their business from Burma to Singapore. Tiger Balm ointment was named after Aw Boon Haw as his name means Gentle Tiger. I am very sure most of us have used this ointment on more than one occasion be it for muscle aches, headaches or a bloated stomach. 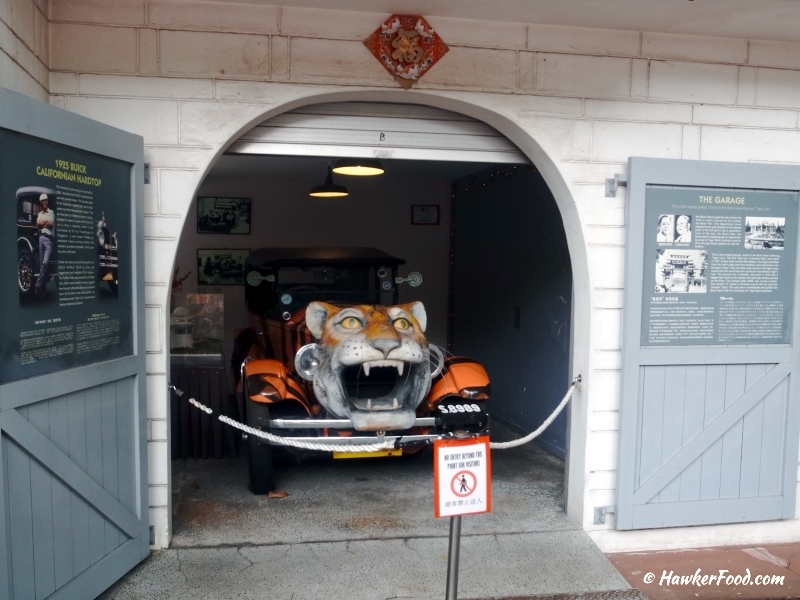 This is the garage that housed Aw Boon Haw’s Tiger cars used for promoting the Tiger Balm Ointment. Does it remind you of the “Cat Bus” in Hayao Miyazaki’s 1988 animated film “My Neighbour Totoro”? 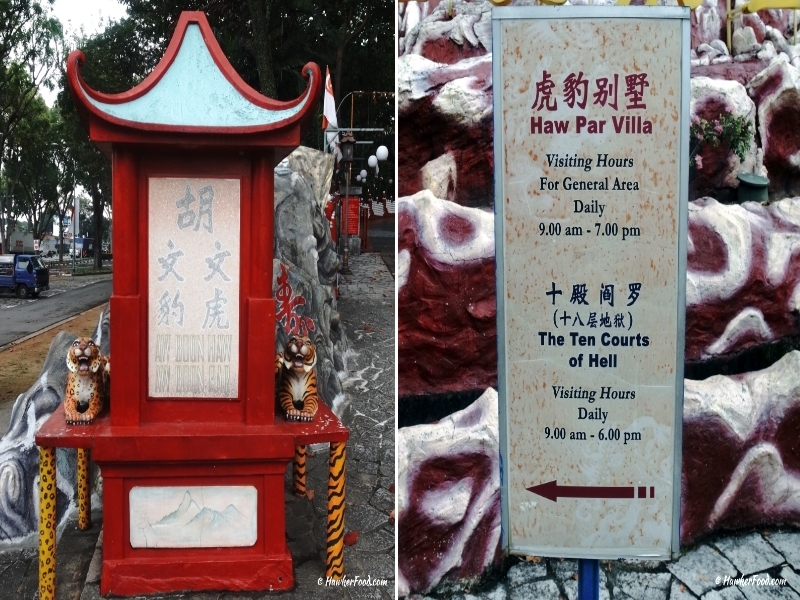 The first stop that I wanted to go was the Ten Courts of Hell as that is the most popular attraction in Haw Par Villa that features gruesome images of Hell in Chinese mythology. 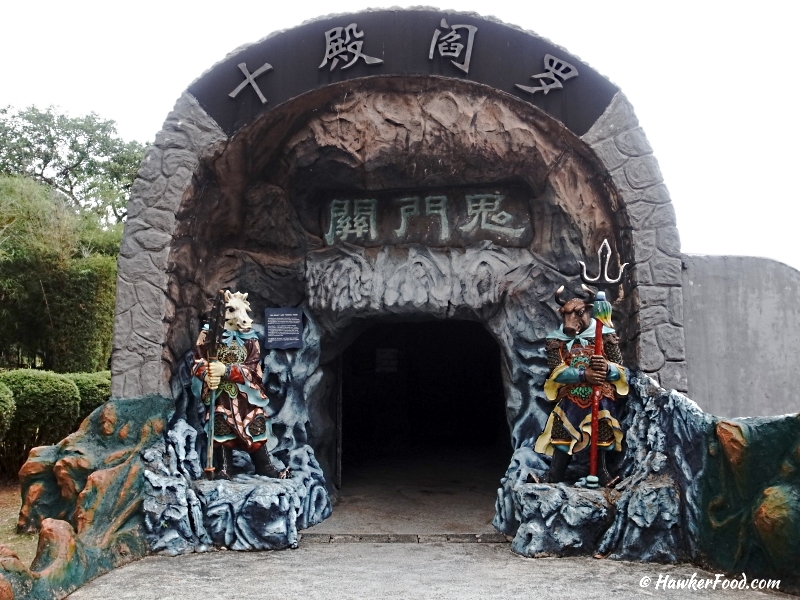 Ox-head and Horse-face (牛头马面) guide the entrance to the Ten Courts of Hell. They function as guards or escorts of the Nether World. The Ten Courts of Hell used to be housed inside an iconic long Chinese dragon but it has since been demolished which I felt was such a waste. 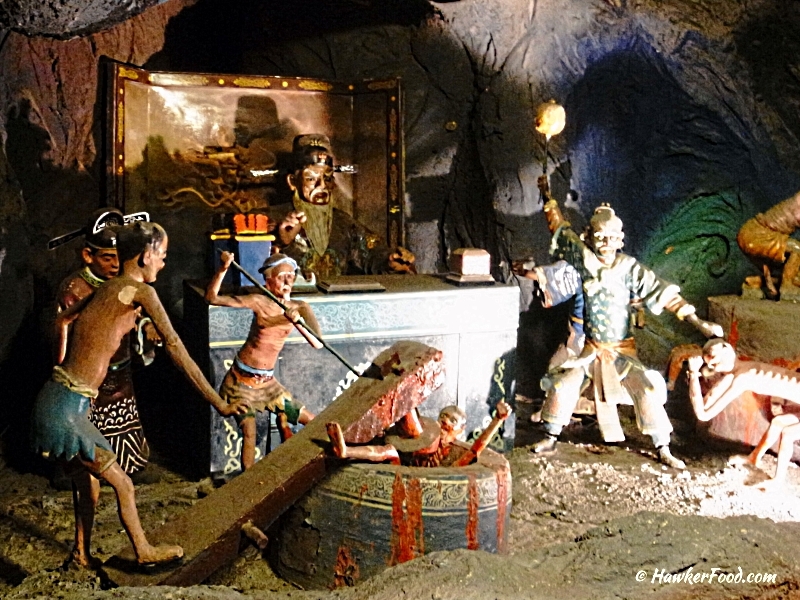 This is the First Court of Hell where King Qinguang conducts preliminary trials and judge individual prisoner based on the deeds in his past life. Basically this is to segregate the Saints and Sinners. The King will recommend reward or punishment. Punishment will then be carried out at the various courts. So if one had been living a virtuous life, they will cross the Golden Bridge to reach paradise. If the good deeds outweigh the bad ones, they will take the silver bridge to paradise as well. If one had been a evil-doer all his/her life, they will be sent to repent before the Mirror of Retribution and will be subsequently taken to the relevant Court of Hell for the punishment to be meted out. 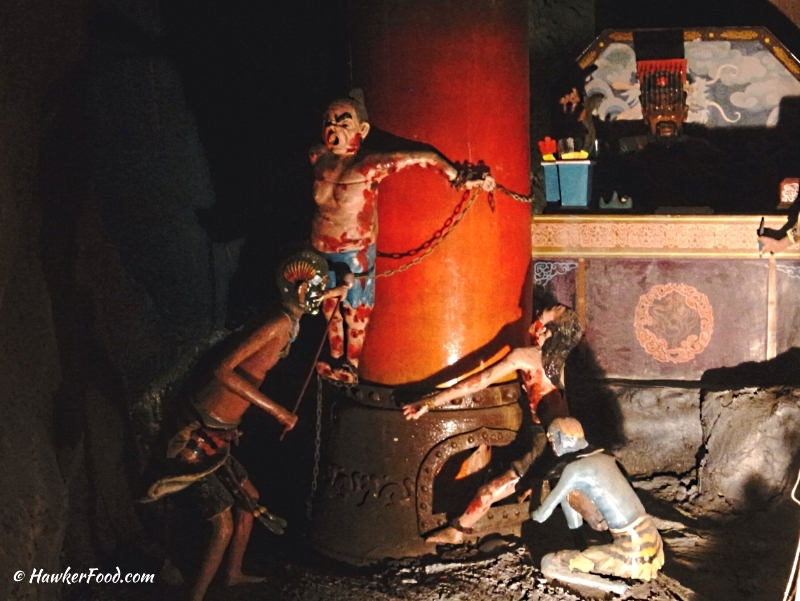 Now, I am not going to show all the pictures I took of the Ten Courts of Hell as it will be better for you to be there personally to experience, read and see all the information and get all sorts of goosebumps while your are there. Punishment – to be grounded by a large stone. 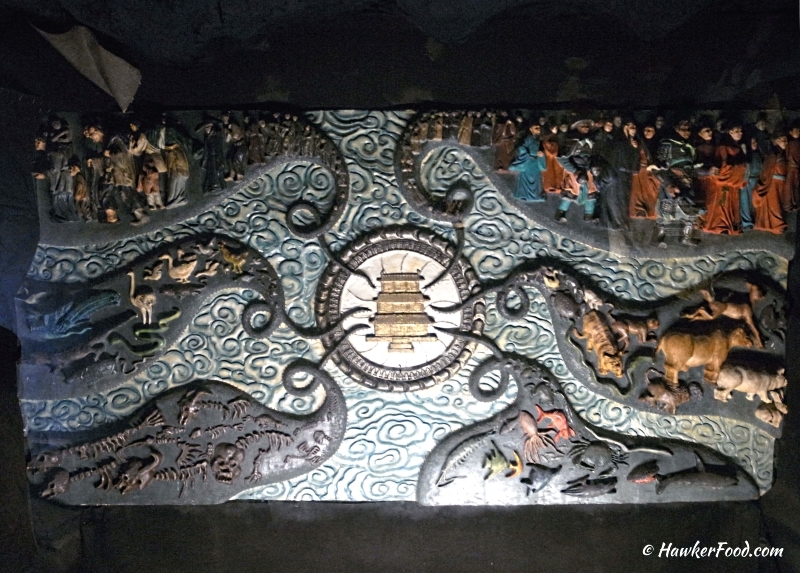 After serving their sentences, the sinners will arrive at this court and King Zhuanglun will pass final judgement. 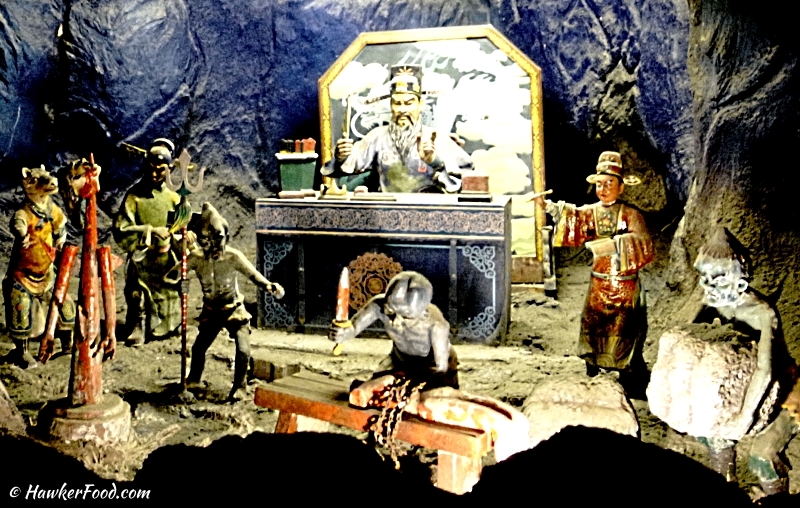 Thereafter the sinners will be brought to “Meng Po” (孟婆) at the Pavilion of Forgetfulness to drink a magical tea to make them forget their past lives. They will then go to the Wheel of reincarnation also known as “Samsara”, there are a total of six paths. The sinners will be reborn as human, one that leads a good life or one that leads a tough life or as a form of an animal depending on their deeds in their past life. After visiting the Ten Courts of Hell which gave me a spine tingling feeling, I was glad to be walking outside of the Courts and onto more Chinese Mythical statutes. I will let the photos do the talking. Hey, what is the Statue of Liberty doing here??? Confucius (孔子) says “Never impose on others, what you would not choose for yourself”. A great philosopher that most of us know. Reminded me of the old chinese zombie (僵尸) movies by the legendary actor Lam Ching-ying (林正英). The sumo wrestlers are the only statues I did not forget. I vividly remember when the Super Nintendo game Street Fighter II was released in the 90s, one of the characters was Edmond Honda. 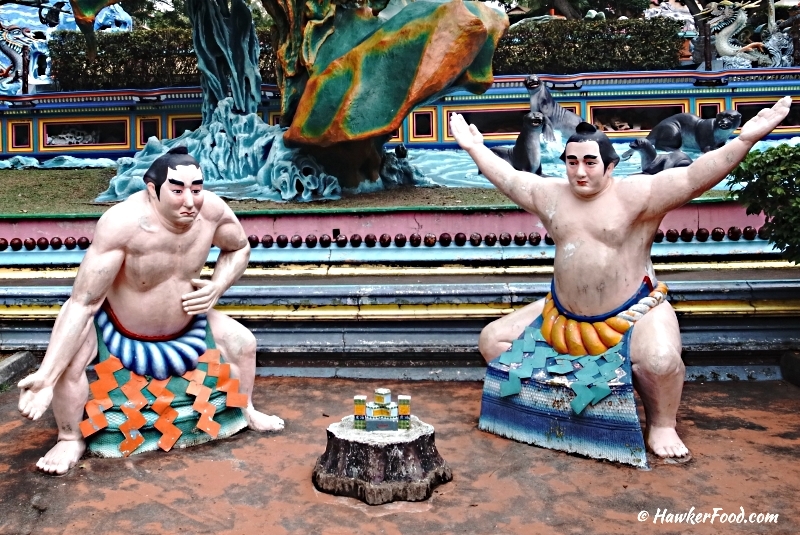 Upon seeing Edmond Honda in the game, it instantly reminded me of these two sumo wrestlers statues in Haw Par Villa. 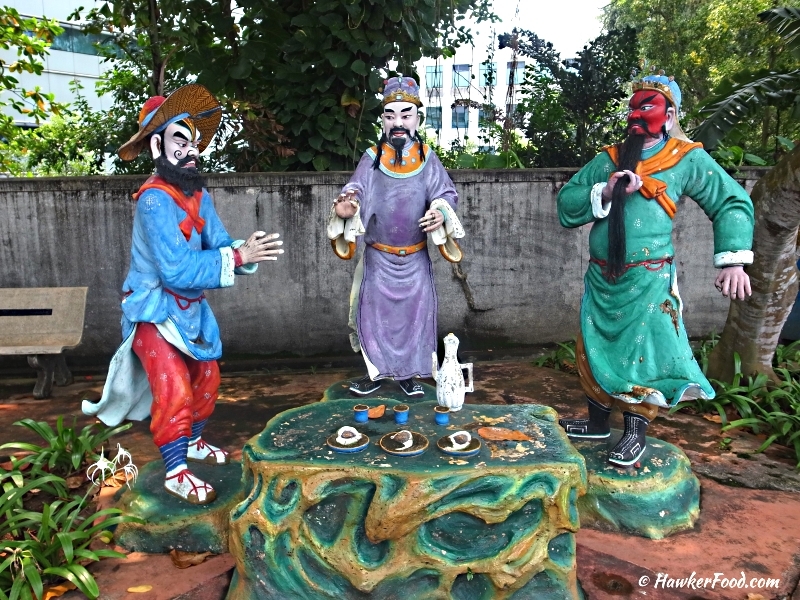 The deities Fu, Lu and Shou (福禄寿). 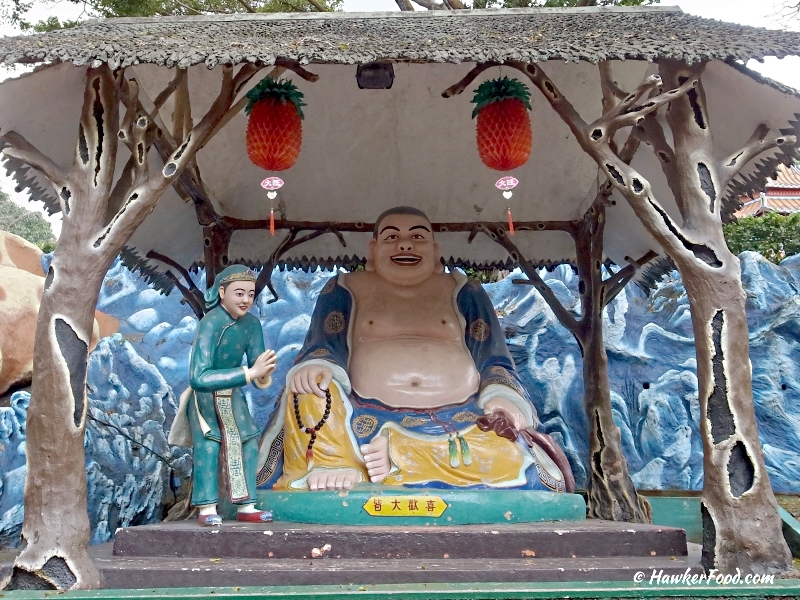 They are regarded as deities of Prosperity (Fu,福), Status (Lu,禄), and Longevity (Shou,寿). 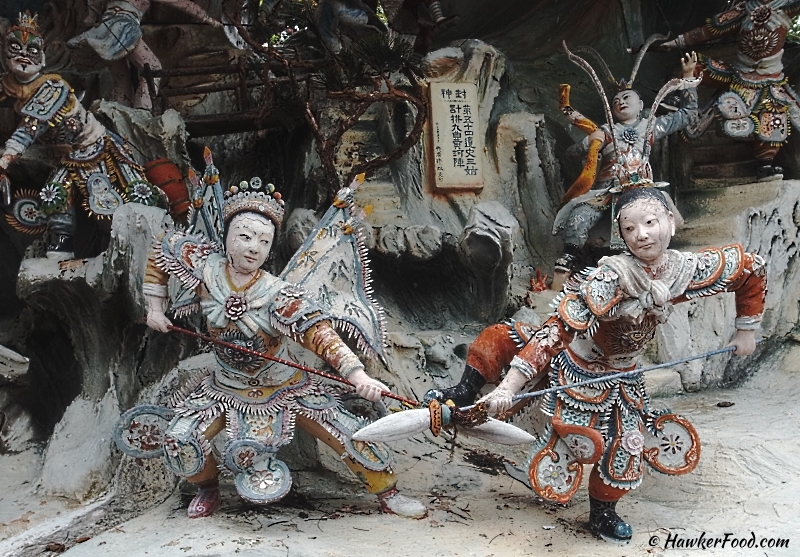 You can also find the smaller statues of these three deities in some Chinese homes. You can clearly see some of the statues really need some maintenance or a new coat of paint. At first sight, I thought this was a scene out of Titanic. This is actually a story of “The Grateful Tortoise”. A man by the name of Wang Qing felt sorry for the tortoise which was being carried in the market. He bought the tortoise and set it free in the sea. 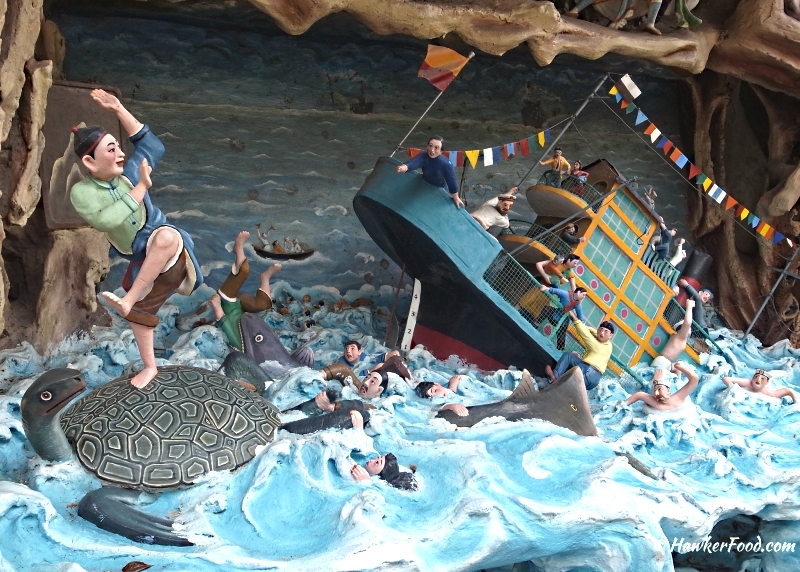 Many years later Wang Qing was on a sunken ship and he was rescued by the tortoise while many were drowned. He went on to marry a heiress and lived happily ever after. This scene is from the Romance of the Three Kingdoms, where Liu Bei, Guan Yu and Zhang Fei partake in a ceremony known as the “Oath of the Peach Garden” and became sworn brothers. 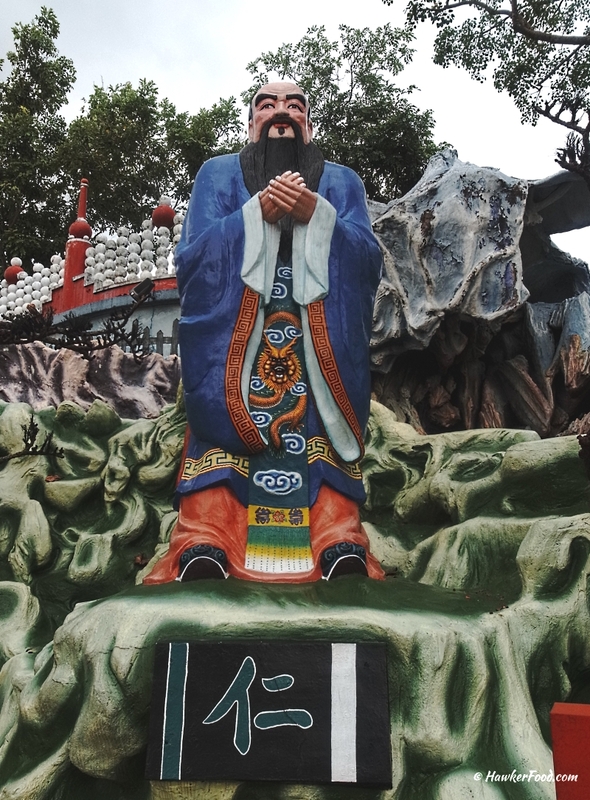 Large Goddess of Mercy statue and a large general Guan Yu face statue on the wall. 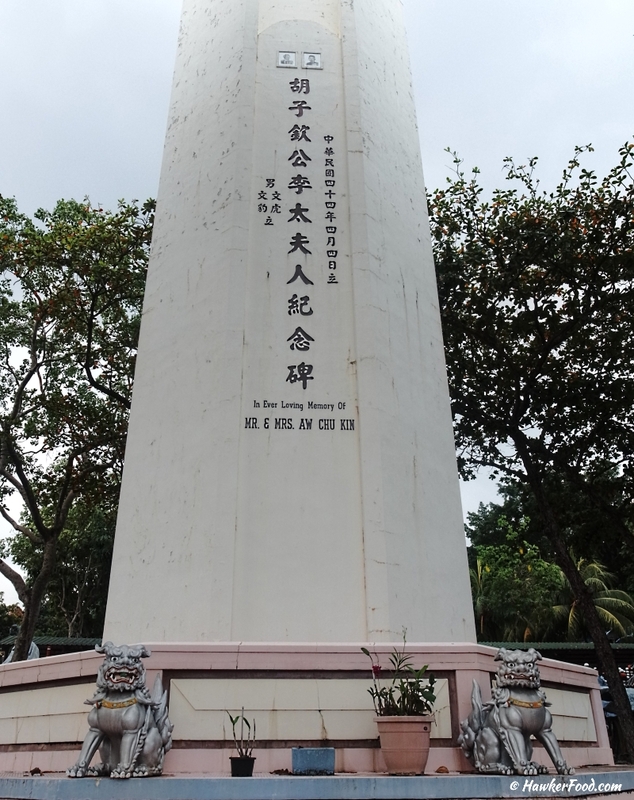 This memorial is for the parents of Aw Boon Haw and Aw Boon Par. 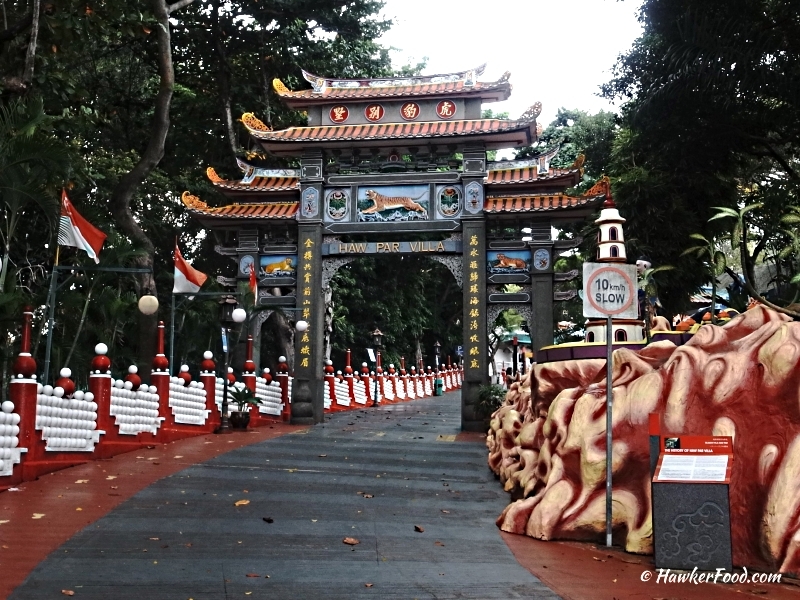 In total there are four memorials in Haw Par Villa, this memorial of their parents is the grandest. 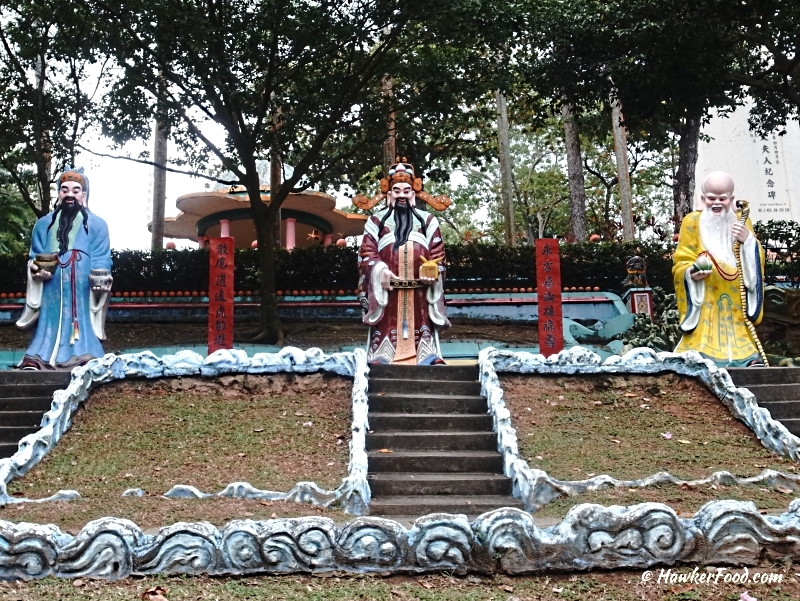 The other three memorials are for Aw Boon Haw, Aw Boon Par and the lesser known Aw Hoe who was Aw Boon Haw’s eldest son. This is Monkey King fighting Scarlet Child in the Journey to the West tale. 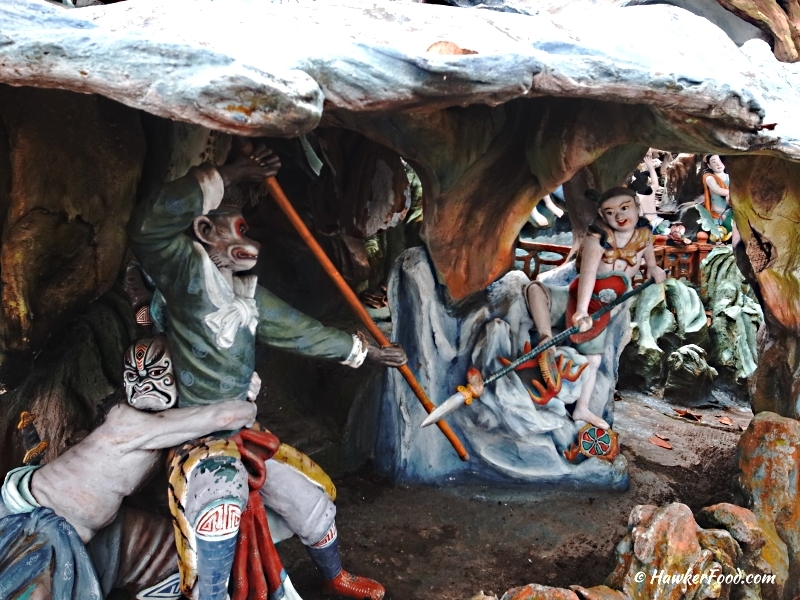 Tripitaka also known as Xuan Zhang (玄奘) or Tang San zhang (唐三藏), he and his disciples Monkey King, Sandy and Pigsy went on a pilgrimage to India to obtain a set of Buddhist sutras (Journey to the West). He has no fighting powers and has to rely on his disciples for protection. Before I left, I took this photo of the tiger guarding the house, the look of this tiger seems so docile and calm. 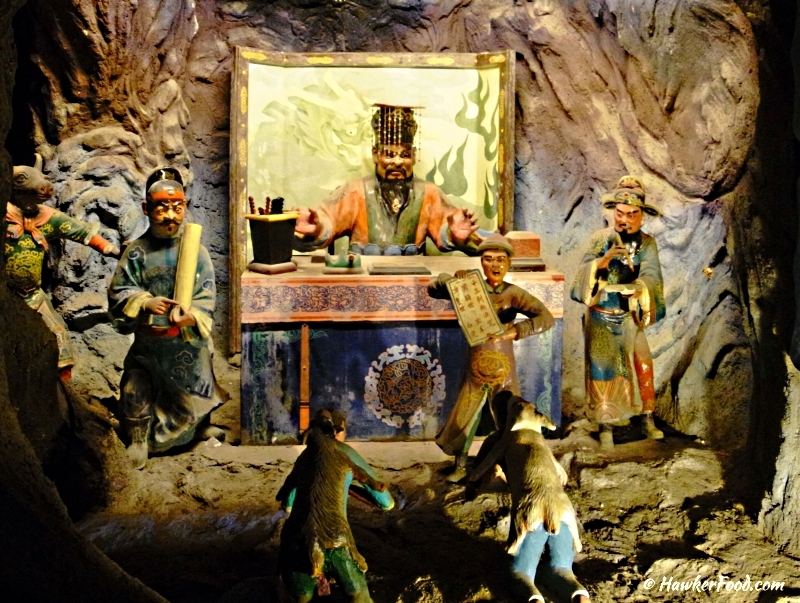 With a smorgasbord of statues and dioramas detailing the various Chinese Mythical tales like Journey to the West (西游记), Madam White Snake (白蛇传), The Eight Immortals (八仙), The Eighteen Arhats (十八罗汉) and most notably the Ten Courts of Hell, this is a theme park for both the young and old. 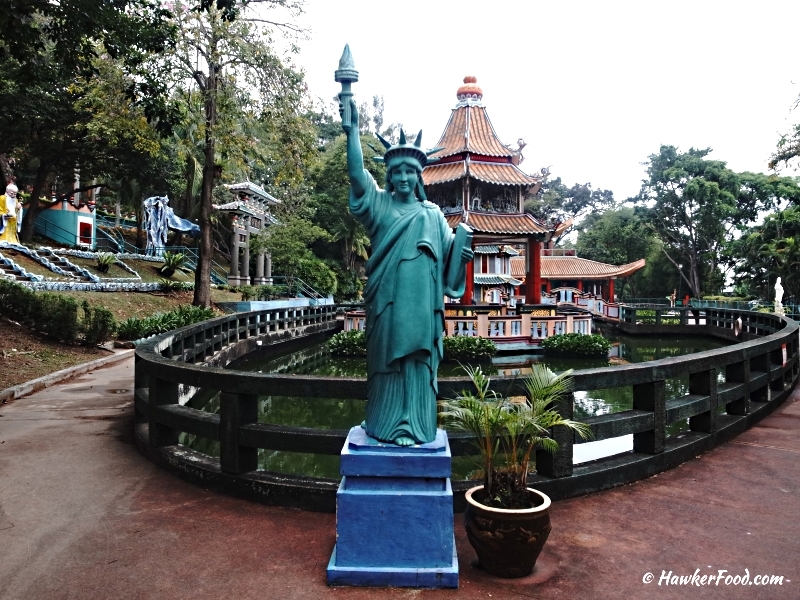 I am sure the new company that has taken over the operation and management of Haw Par Villa will improve and make Haw Par Villa more Tourist friendly with Food and Beverage and Retail stores which means there will also be job opportunities. 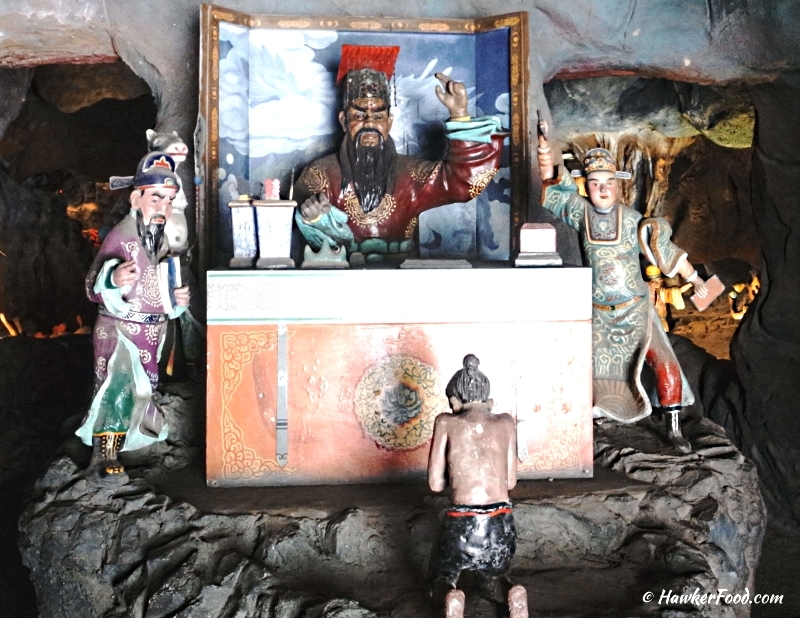 Lao Beng urge you to pay a visit to Haw Par Villa before it gets too crowded due to commercialization. It is better to be spooked at the Ten Courts of Hell with lesser people (pun intended).